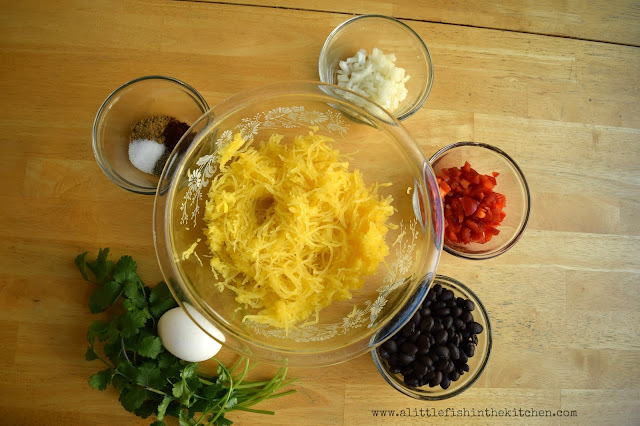 Spaghetti squash was new to me as recently as two years ago, but it's become a staple item here in my kitchen. I just love it! One medium-sized squash makes a lot of food and for that reason alone, it's a good thing it's such a versatile vegetable. I typically buy one good-sized spaghetti squash, roast the whole thing and then use it, one half at a time, to make two different dishes. I shredded the first half of this squash and then prepared it one of my favorite simple ways by lightly tossing it with olive oil, parmesan cheese and marinara. But, I wanted to try something different with the second half. I have a serious thing for food shaped into patties. I mean it, I can't resist dishes on menus called: burgers, cakes, patties, pancakes, fritters, or loaves. Whatever you want to call such dishes, I firmly believe that many types of meat and vegetables, or both, are better formed into fun, round shapes. 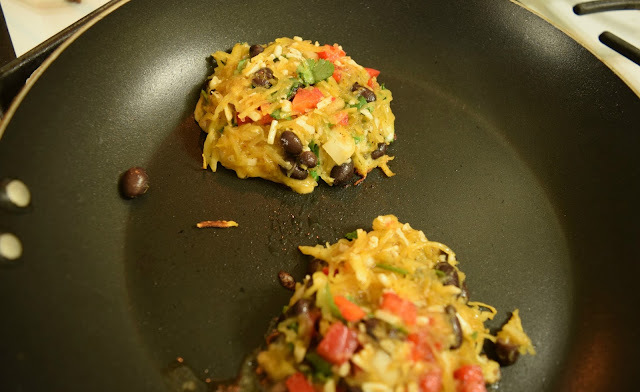 So, anyhoo, I really wanted to create spaghetti squash cakes of some kind. 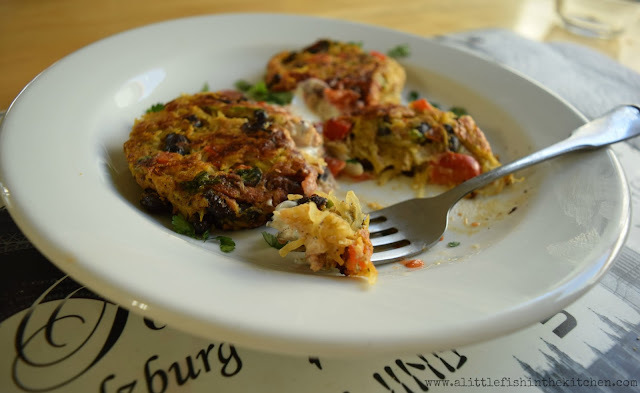 I was craving something like these zucchini-potato pancakes that I made some time back, but I wanted some heat, smoky spice and a Mexican flair. So, with the squash, I mixed in some cooked black beans, red bell pepper, onion, fresh cilantro, jalapeno jack cheese and some smoky spices in a bowl. Lastly, I added one egg to bind it all together. These cakes are bit messy to form in your hand. Just take your time and don't try to rush when putting them together. The moist squash mixture loosely forms into the patty shape and the structure really comes together when the egg cooks through it in the pan. So, don't freak out if they come apart slightly when you add them to the pan or when you flip them, okay? Just use your spatula to gently push and form them back together and all will be fine. These are worth the effort and they turned out even better than I expected. I'm so excited to share this recipe with you all! I dare say, that this is another keeper for the meatless meal list! 1. First, remove as much excess moisture from the spaghetti squash as possible by lightly squeezing the shredded squash, one cup at time, between paper towels. 2. Combine drained squash with the rest of the vegetables and the spices. Mix well and then fold in the beaten egg. 3 Heat your skillet to medium heat. One at a time and as best as you can, form the squash mixture into 3-4 inch patties. 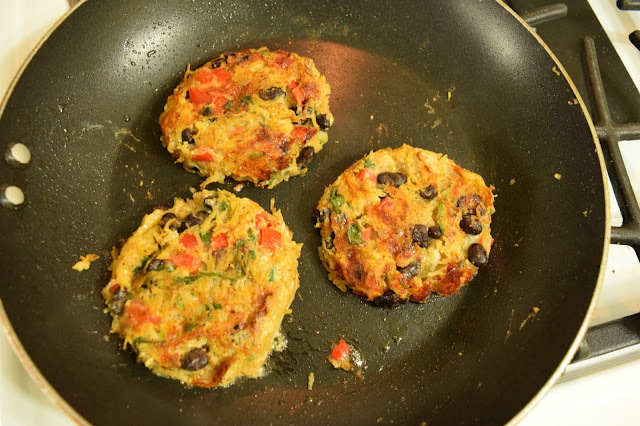 Spray the skillet with non-stick spray and add the patties, one at a time, to your pan. 4. Cook over medium heat about 5-6 minutes on each side or until firm and done. 6. Serve with sour cream, salsa and guacamole, if you like. Enjoy! You won't see any squash in our supermarkets as soon as the Halloween is over. These squash patties look droolworthy, Marcelle. 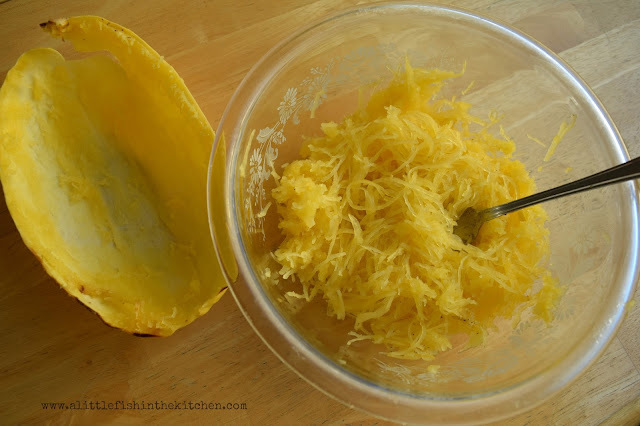 This is a way I might be able to get Mark to eat spaghetti squash! I love this. And you made it naturally garlic-free! Thanks, Marcelle!! I have never had spaghetti squash and I certainly didn't know it could be made into cakes. What a great dinner idea! Dear Marcelle, this looks like one wonderful and delicious way to cook spaghetti squash - who would have thought that you could make such wonderful squash cakes out of all those lovely ingredients - a great idea for kids´ lunches! 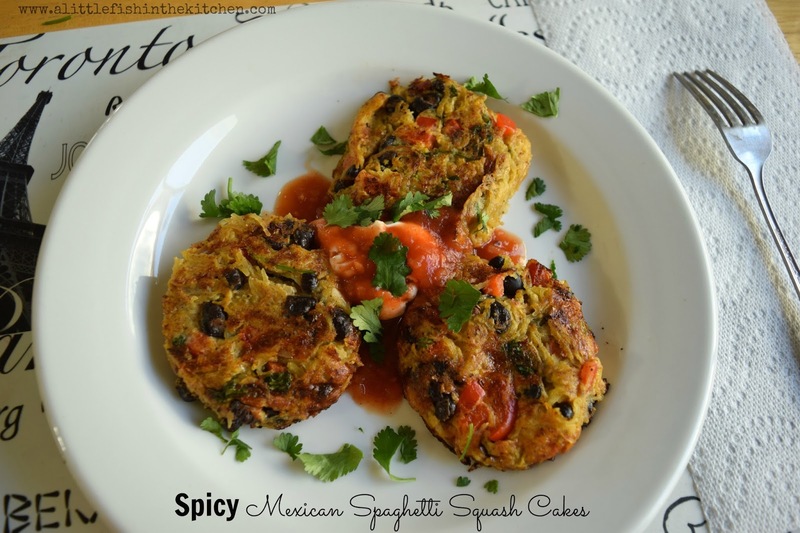 Hi Marcelle, so clever to make squash cakes, I always make the same ole thing every time out of spaghetti squash. What a terrific idea. 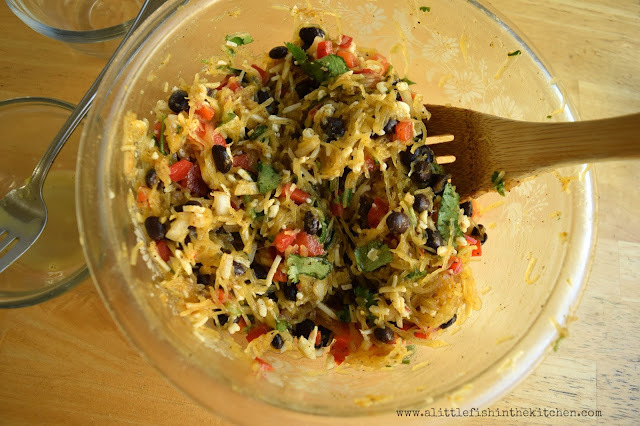 I like spaghetti squash and can't wait to try preparing them like you have done. excellent! 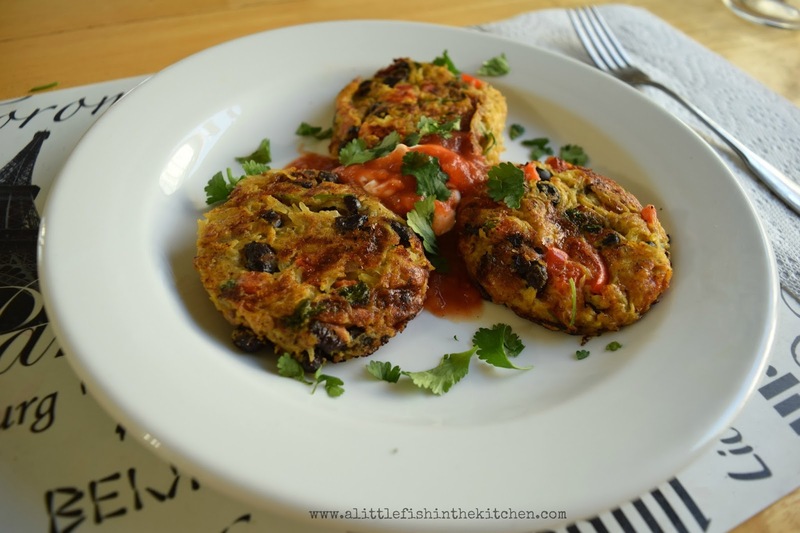 i'm a big fan of spaghetti squash, though i've never turned it into little patties like this--brilliant! i love the mexican flavors and ingredients too! Hi there Sonia, thank you for reading my blog and thank you for your comment! Presently each post has a print option at the bottom of the page, and late last year I added a recipe card print option that's available on all newer posts. I'm working on updating older posts with the recipe card function too, it just takes a while to get back through all of the posts. I'll be sure to update date this one soon for you!